This problem has become common now, since we have been getting many queries on the same. Possible reason behind the issue might be due to some software installation that is adversely affecting or changing IE restriction settings. It might be also possible that you are running IE in No Add-on mode. Below are two solutions which you can check and troubleshoot your problem. If you are ruining IE in No Addon mode, i.e. –extoff, then you might see the Manage Add-on grayed out since Add-on are disabled. 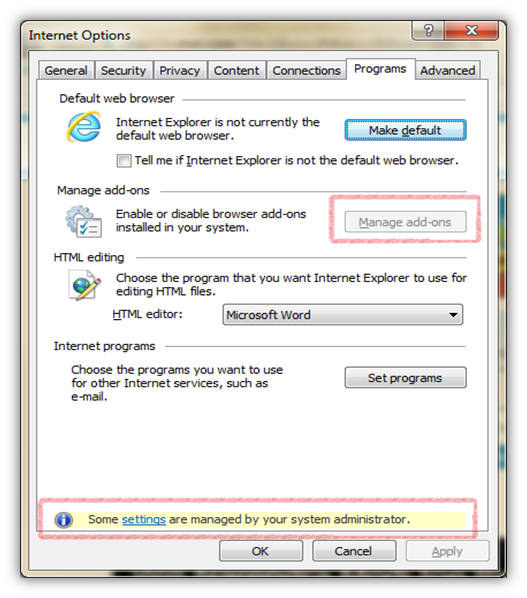 If you are running IE using the desktop shortcut, then check whether you are running in –extoff mode. Right-click on IE icon and select Properties, and check if the target destination end with –extoff. 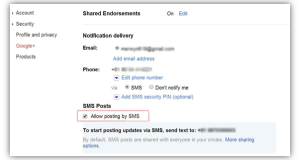 In case if it does end with –extoff, then remove the –extoff part. You can also check opening IE directly instead of opening through desktop shortcuts. The IE installation files are generally saved in Program files of Windows directory. Open Run Dialog Box, press Windows Key + R.
Check whether Manage Add-on is enabled, if still Manage Add-on grayed out, then its probably the issue with restriction setting, which might have gotten changed. Follow the below solution to change IE Restriction settings. There is a restriction setting option in windows where it can Enable/Disable users from accessing Manage Add-on button. If this restriction is enabled, Manage Add-on will be grayed out and user won’t be able to manage add-on in IE. 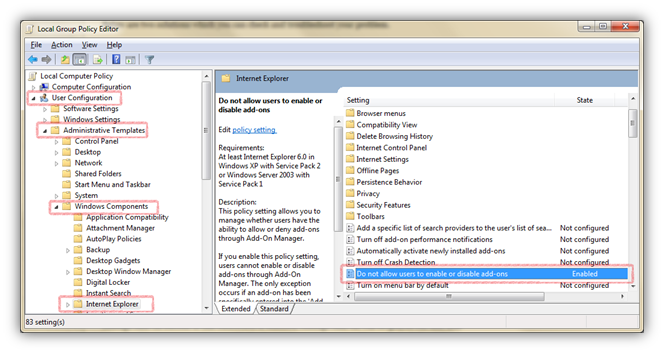 To change the setting, we would use Group Policy Editor to Disable the restriction. Open Run Dialog Box, press Windows Key + R and type gpedit.msc and press Enter. 3. Double-click on setting and set it as “Disabled ”, click on Apply and OK to save the settings. The Manage Add-on should be enabled now under IE Internet Option. Next: What is Virtual Machine and Why is it used? Roshan Karkera a.k.a. k.roshan. Blogger by passion and software engineer by profession. He believes in sharing knowledge, which made him to start his own blog. He is very much keen & passionate about new technology & Science. If you'd like to connect with him, follow at Google plus or Twitter.